Salmone in crosta, or Salmon en Croûte, is one of those dishes that every cook should have up their sleeve. 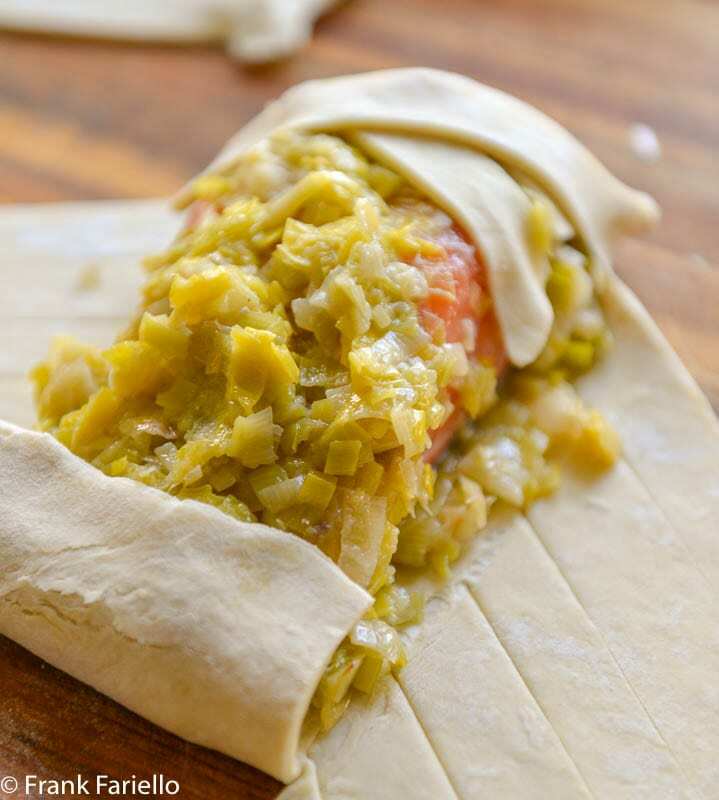 Its combination of mildly sweet salmon, savory braised leeks and buttery puff pastry is perfectly delicious. And it makes an elegant presentation at the table. But you needn’t tell your guests it’s also pretty quick and easy to make—at least if you buy the pastry, which I always do. 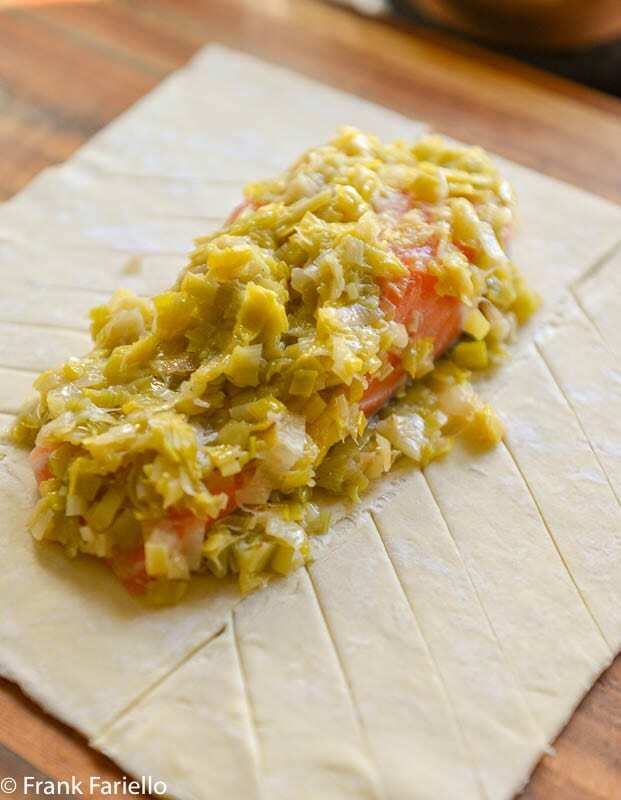 You just lay down a bed of the leeks on a pastry sheet, lay over a salmon fillet, top that with more leeks, then wrap it all up in a pastry bundle, all of which you can prepare ahead. When you’re ready to eat, just pop the bundle in a hot oven for a few minutes et voilà! dinner is served. Your guests will be duly impressed and you’ll have plenty of time out of the kitchen to enjoy their company and conversation, too. Salmone in crosta would serve as an ideal second course for a cenone di san Silvestro, or New Year’s dinner, perhaps following a risotto allo champagne as your first course. An Italian style shrimp cocktail as an antipasto and perhaps a slice of store-bought pandoro drizzled with melted chocolate for dessert would round out an elegant but easy menu, accompanied by—what else?—a nice bottle of Prosecco to bring in the New Year in style. Trim the leeks of their root and green tops, then slice lengthwise. If you see any grit, wash the leeks and shake them dry. Cut them crosswise into very thin half-ring slices. In a braiser or heavy saucepan, melt a good knob of butter in olive oil over gentle heat, then add the leeks, along with a generous pinch of salt and a good grind of black pepper. Give the leeks a good mix and let them sweat for a minute or two. Then add a drizzle of water and cover. Let the leeks stew for 10-15 minutes, until they are very soft, stirring from time to time and adding another drizzle of water if things get too dry. Take care not to brown the leeks at all. When the leeks are soft, uncover and turn the heat up a bit to let any excess moisture cook off. When you just start hearing the pot sizzle, turn off the heat. Now lay out the sheet of puff pastry on a cutting board or other clean surface. In the center, lay over a thin ‘bed’ of the braised leeks about the size and shape of the salmon fillet. Lay the salmon on top of its bed, then cover the fillet, top and sides, with the rest of the leeks. 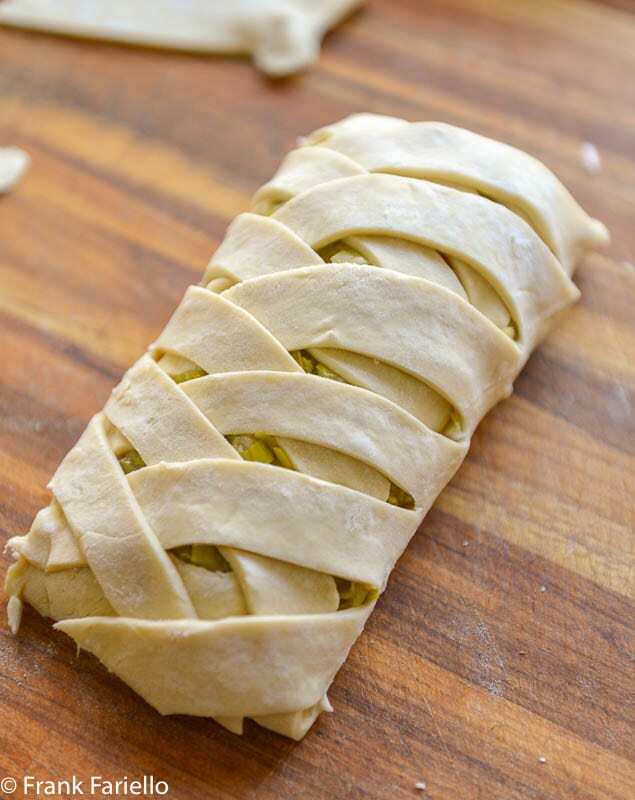 Now take the sides of the puff pastry and fold it over the salmon and leeks to make a neat bundle, trimming off any excess pastry. You can use the trimmings to cut out decorative shapes to lay on top of the package. Or if you like, you can make a decorative latticework as pictured (see Notes below for detailed instructions). Transfer the bundle to a baking sheet. (If not using the latticework, prick the top here and there.) Beat the egg yolk and milk until smooth and brush the resulting egg wash all over the top of the pastry. Bake the bundle in a hot (200C/400F) oven for about 20-25 minutes, until the pastry is puffed up and golden brown all over and the fish is cooked through. Let the salmon rest to cool off a bit before serving. Salmone in crosta in best served only slightly warm. It is also perfectly lovely at room temperature. While to my mind leeks provide the ideal complement for the salmon, you can vary the vegetable pretty much as suits your mood and the season: shredded zucchini in the summer, thinly sliced asparagus in the spring, a duxelles of mushrooms in the fall, chopped spinach more or less any time of year. For these vegetables, I’d add a bit of minced shallot to sauté gently in the butter and oil for a minute before adding the main vegetable. A dollop of cream or mascarpone would enrich the spinach nicely. You could also purée the filling if you like, which might not be a bad idea for a relatively bulky vegetable like asparagus. 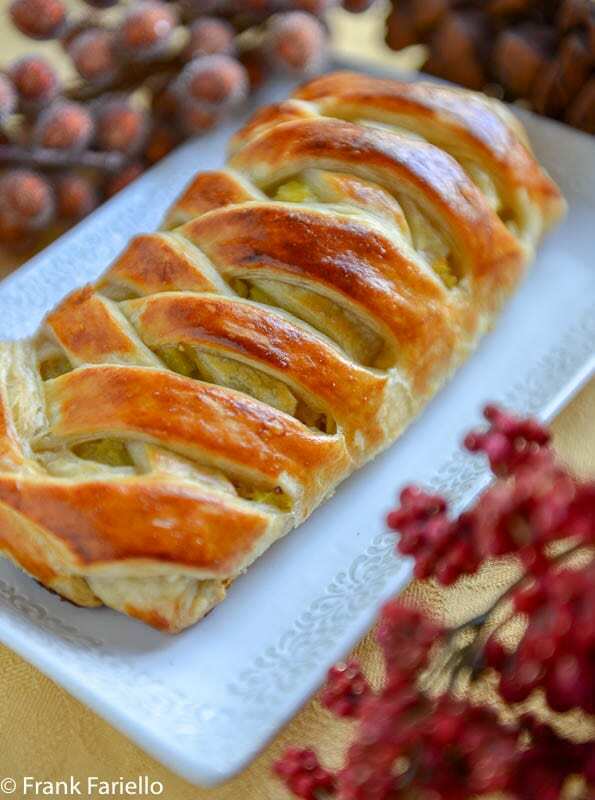 As mentioned, you can use any puff pastry trimmings to cut out decorative shapes—like little stars or Xmas trees this time of year—for topping your bundle. It’s not really needed on a lattice top but provides a nice touch if you’re opting for simply folded pastry. Some recipes for salmone in crosta have you pan fry the salmon beforehand, but unless your fillet is particularly large, I don’t really see the need. 20-25 minutes in the oven should be plenty of time to cook a modestly sized salmon fillet through, and there’s nothing more disappointing than overcooked salmon. And rather than trying to cook a larger salmon fillet this way, I would make life easier for yourself and prepare more than one bundle if you’re having more than 2-3 for dinner. Not only will this simplify the preparation, it provides the right balance between pastry and filling. Now lay out the sheet of puff pastry on a cutting board or other clean surface. In the center, lay over a thin 'bed' of the braised leeks about the size and shape of the salmon fillet. Lay the salmon on top of its bed, then cover the fillet, top and sides, with the rest of the leeks. Now take the sides of the puff pastry and fold it over the salmon and leeks to make a neat package, trimming off any excess pastry. You can use the trimmings to cut out decorative shapes to lay on top of the package. Or if you like, you can make a decorative latticework as pictured (see Notes in blog post for detailed instructions). Transfer the package to a baking sheet. (If not using the latticework top, prick the top here and there.) Beat the egg yolk and milk until smooth and brush the resulting egg wash all over the top of the pastry. Bake in a hot 200C/400F oven for about 20-25 minutes, until the pastry is puffed up and golden brown all over and the fish is cooked through. Let the salmon rest and cool off. Salmone in crosta in best served warm but not hot. It is also perfectly lovely at room temperature. l’aspetto è splendido , qui da te c’è sempre l’imbarazzo della scelta, sei una miniera di idee ! Buon Anno Frank ! Such an elegant entree, fit for any special occasion. I also used purchased puff pastry, time is at a premium these days and there are some excellent products on the market. This is ideal fo Valentine’s Day Frank, something rather romantic about it. Sounds like a fine idea, Paula! What a beautiful presentation Frank, love that the salmon is paired with t he braised leeks, what a gorgeous combination. I have made something similar in the past, with the salmon, but now I know to add leeks as well. Puff pastry does it for me all the time, whenever I see Pepperidge Farm sheets on sale, I buy a couple for the freezer. They’re so very useful, aren’t they? Happy New Year! What a fun recipe, Frank! We often make a similar version of salmon, but I’ve never done it with the latticed puff pastry. This sounds delicious! And I totally agree with you that nothing is worse than an overcooked piece of salmon. I’m putting this on the menu to try sometime soon…it’d be great for dinner parties! Thanks, David. And Happy New Year! Very nice and elegant dish. I love salmon. Happy New Year Frank! Buon Anno!!! It really is an elegant presentation, Frank. I owe so many friends a dinner after all the holiday parties I was invited to and your whole menu ideas would be the perfect meal to serve. Thanks so much, Karen. If you decide on that menu, do let us know how things go. Happy New Year! Dear Frank, Thank you for giving us another year of awe inspiring recipes! Your effort and detail are very much appreciated. We wish you all the best and a healthy and happy 2019! And thanks so much for your readership, William and Joan. Happy New Year! Very nice, Frank! I agree with your choice of leeks. Happy New Year! Happy New Year to you, too, Simona! This sounds wonderful. I have to admit, though, that I was reading a bit too quickly, and for a moment, when you wrote that to start, you … “simply lay down a bed of the leeks…,” I thought you’d said that to start, you simply lay down in bed. Now, that would be my kind of recipe! I made my «saumon en croûte» yesterday for an upcomg post – I never realized there was an official recipe, and just made something up one day on my way home from work! 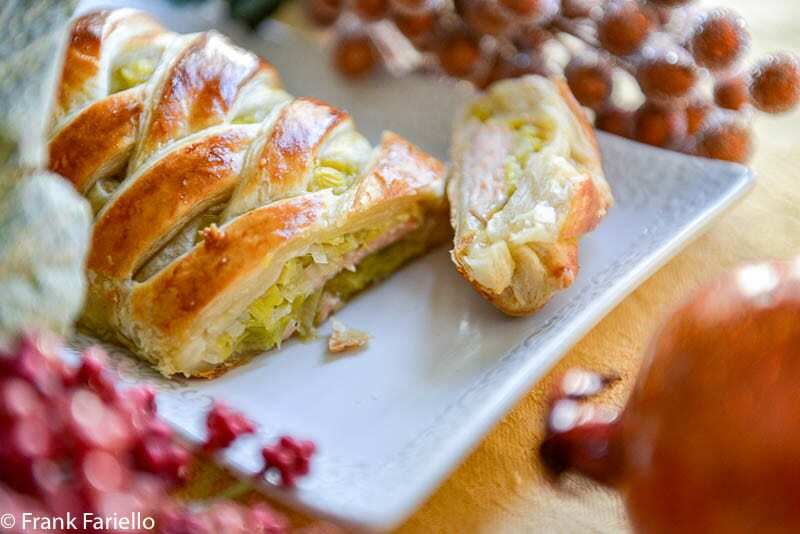 Yours is absolutely beautiful – love the braided puff pastry! What a wonderful treat for the new year. David, you’re a culinary genius! But then we knew that already. 🙂 Anyway, thanks for the kind words and Happy New Year! Frank – I am so eager to try this beautiful recipe and would make it tonight for New Year’s eve if we didn’t have that bottle of Barolo waiting for a pairing with filet mignon. But you can sure bet I’ll be adding this to my repertoire for special occasion meals. The fact that it’s so easy piques my interest even more. pinning this one too. Hope you enjoy it, Linda! Actually I’m pretty sure you will… Happy New Year! This must be the most beautiful centerpiece on the table. The pastry has such a perfect golden color. And one would never guess it hasn’t taken all day. So fancy! Wishing you a very happy (& delicious) new year! Same to you and yours, Valentina. Thanks for stopping by! This is absolutely gorgeous!! I was trying to think of something special for Date Night In — Valentine’s Day! We hate fighting the crowds and I think making a special dinner together at home makes the experience more romantic. Not only feeding your tummies but also your romance. Perfect! And I believe your risotto allo champagne would do nicely along with it and since we don’t eat a lot of dessert perhaps a special after dinner drink. Do you have a suggestion? I so agree about fighting the crowds, whether it’s NYE or Valentine’s Day. As for an after-dinner drink, I’m always partial to Italian liqueurs, of course. After a particularly delicate fish dinner, something not too heavy. Perhaps a grappa? Or if that’s too strong, a limoncello, even if it’s not summer it would go nicely. What a lovely fresh version of a classic dish I know and make as ‘coulibiac’ . . . yours is much easier to prepare and no doubt very palate-pleasing . . . Thanks, Eha. Learned a new word… ? Happy New Year! This is just beautiful! I love the salmon and leeks combo. The pastry I didn’t know was puff pastry – I guess because of the egg wash! So pretty. Thanks, Mimi. Happy New Year! I love this recipe, but already have dishes made or planned for New Year’s. Will keep it in mind! A supermarket I shop at (Métro) has this in its premium range, must remember to pick a packet up as it is on promo this week. I’ve made duck empanadas, and am doing a southeast Asianish shrimp dish… Not a large or elaborate meal. I love salmon, but this recipe would be very easy to make vegetarian if you should happen to have a vegetarian guest. Just that portion would need to be changed, keeping the same greens and adding a protein food that the guest would eat. Yes, that’s right. And the duck empanadas sound delicious. I love duck. ? Yes, I do too. There is a significant duck production here, and from time to time frozen ducks go on sale for only about $2lb/4,40kg. They are fine for making empanadas or tourtières (traditional Québec Christmas/New Year’s meat pies). Of course I would buy a fresh duck from a poulterer or butcher if I’m roasting it! Boom! I am so doing this – not even for company. Just for family. I love the combination and the simplicity. Thanking you ahead for the deliciousness… Happy 2019. And thank you for stopping by, Claudia! Happy New Years to you and yours! Great looking dish — looks fancy, but reasonably easy to prepare. I almost never make puff pastry these days — the frozen stuff is pretty good, and so convenient. Great dish — thanks. Totally agree, John. Happy New Year! Thanks so much, Christina, for the kind words. Happy New Years to you, too! Elegant, tasty AND easy? I’m all over that for sure. I have all of the ingredients in the freezer too! Definitely bookmarking for the new year, I already have NYE menu worked out! (One of which are your zucchini fritters!) Merry Christmas and Happy New Year Frank. Happy New Year to you, too, Eva. Enjoy! Frank, this is a classic dish and you’ve honored it well. I’m very impressed with your lattice work and inspire me to make this soon. Have a safe and happy new year’s eve. Same to you Ron. Happy New Year! Frank, this is stunning, I am tempted to make it for New Years , if not, I will make it when I return from my trip. Thank you for the recipe. Where do you buy your puff pastry? Do you recommend a specific brand? I am not familiar with puff pastry. I got mine at the local supermarket. You’ll laugh but I just used good old “Pepperidge Farm” brand to save money and it was fine. The other main brand, Dufour, is perhaps the finer product—with a butterier flavor—but also more expensive. And in this case the filling is so savory you may not tell the difference!